Fair Park in Dallas, Texas is one of the finest collections of Art Deco architecture in the country, but it is so much more: the embodiment of Texan swagger, it is a testament to the Texanic task of creating a dazzling spectacle in the darkest days of the Depression. Fair Park Deco focuses specifically on the Art Deco art and architecture of Fair Park. 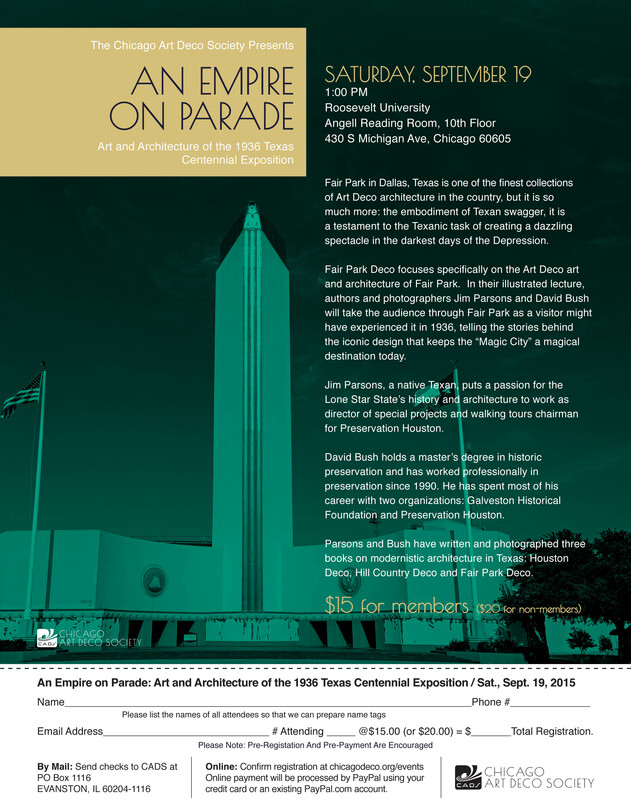 In their illustrated lecture, authors and photographers Jim Parsons and David Bush will take the audience through Fair Park as a visitor might have experienced it in 1936, telling the stories behind the iconic design that keeps the "Magic City" a magical destination today. Jim Parsons, a native Texan, puts a passion for the Lone Star State's history and architecture to work as director of special projects and walking tours chairman for Preservation Houston. David Bush holds a master’s degree in historic preservation and has worked professionally in preservation since 1990. He has spent most of his career with two organizations: Galveston Historical Foundation and Preservation Houston. Parsons and Bush have written and photographed three books on modernistic architecture in Texas: Houston Deco, Hill Country Deco and Fair Park Deco.